Hambantota port deal signed yesterday; security matters will be strictly under the SL, says Govt. The ruling coalition, now in its mid-term rule, faced some of its worst moments this week. One that sent shockwaves countrywide were revelations before the Commission of Inquiry probing the Central Bank bond scam. A witness declared that the rent for the luxury apartment was paid by Arjun Aloysius until it was purchased by a company associated with Foreign Minister Ravi Karunanayake’s family. Aloysius’ firm Perpetual Treasuries is at the centre of the Commission’s inquiry where mounting evidence is unfolding about serious irregularities and the plunder of state funds. Petroleum sector trade unions went on strike urging the Government not to go ahead with the Hambantota Port project. State run hospitals came to a standstill as doctors also went on strike. The Cabinet of Ministers, notwithstanding opposition, on Tuesday approved the controversial Concession Agreement with China Merchants Ports Holdings Company Ltd. The term of the Concession Agreement remains unchanged with 99 years. It is only at the expiry of 70 years that the Sri Lanka Ports Authority (SLPA) could purchase shares and transfer of majority (60%) ownership at the end of 80 years. The share composition has been worked out with the formation of two companies – Hambantota International Port Services Co. (Pvt.) – HIPS – Ltd. (SLPA 50.7 % directly and a further 8.7 % indirectly through the second company) and CM Port (the Chinese Company) holding 49.3 percent and Hambantota International Port Group (Pvt.) Ltd. for projects in the Port of Colombo. They cover the South Asia Gateway Terminals (SAGT) and the Colombo International Container Terminals where the SLPA will hold 15 percent as against CM Port 85 percent. An equally important development this week came as further proof of the mounting tension between the Sri Lanka Freedom Party (SLFP) and the United National Party (UNP). President Sirisena now wants to set up a National Economic Council (NEC). Chaired by him, it will be an “advisory body on economic policy in the country to further strengthen policy coherence in the present consensus government….” According to one government source, this new body will be above the Cabinet Committee on Economic Management (CCEM) which is chaired by Prime Minister Ranil Wickremesinghe. When President Sirisena’s proposal came up before the weekly Cabinet meeting last Tuesday, Premier Wickremesinghe sought to defer the matter. He said he wanted to discuss the subject first with President Sirisena. Hence, no discussion ensued and the source said the matter would be placed on the agenda after Wickremesinghe’s talks with Sirisena. Q: Are you a Sri Lankan citizen? Q: Have you been educated in any Sri Lankan school? Q: Where did you carry out your higher studies? A: I studied in UK and graduated in Business Management studies. Thereafter I returned and joined my father who was involved in business. I was supervising a project in Weligama. Q: Do you know Arjun Aloysius? A: I came to know him through one of my close friends while studying at the Colombo International School during 2011–2012 period. Q: Does that friendship remain? A: No. That ended in 2012. Q: Do you know the wife of Arjun Aloysius – Ms Natasha Anjali Mahendran? A: Yes by October 2012 I knew her. Q: Have you spoken to Arjun Aloysius? Q: Have you spoken to Ravi Karunanayake? Q: Do you know Mr Karunanayake’s daughter – Onella? A: Yes, she too studied at the Colombo International School. Q: Do you know Karunanayke’s wife – Mela ? A: I came to know her in February 2016. Q: Do you have a house in the Monarch apartments, Kollupitiya ? Q: Did you purchase it? A: Yes I purchased it from Susantha Ratnayake. Q: Did you renovate it, after purchasing it? A: Yes I spent one million rupees for renovation. Q: Did you occupy it? A: During that period around January 2010 I needed to visit the Weligama project regularly and therefore needed to lease it out. I told my elder brother about it. A: He informed me that Karunanayake was looking for a house. His wife called me. Later she visited the place. Q: Whom did she call from there? A: She told that a friend will be visiting the apartment. Q: Did he come and who was he? A: He was Arjun Aloysius. Q: What was your response? Q: What was his requirement? A: He wanted to rent the place. Q: Did you speak to him? A: Yes, I informed him of my final decision. Q: Does this mean it was a tripartite agreement? A: Arjun Aloysius obtained this house on lease from me and gave it to Minister Karunanayake and his family to live there. Q: For how long was this lease from you? Q: Who were the lawyers who were party to this agreement? A: F.J.&G. de Saram and Walt & Row Associates did the Lease Agreement. Q: Who are the directors of Walt & Row Associates? A: Geoffrey Joseph Aloysius, Arjun Joseph Aloysius and Suren Muthurajah. Q: Isn’t Geoffrey Joseph Aloysius his father? Q: Did Arjun Aloysius contact you after this agreement? A: Yes he did. He told me there are social media reports that the rent on the apartment that Ravi Karunanayake lived in was being paid by him (Arjun). Q: Did you also read them? A: I got the stories that were in the Sinhala language websites translated to English and read them. Q: Did you contact him again after that? A: Yes. I asked him about the Lease Agreement. Q: What did he say then? A: He said that he had destroyed that Lease Agreement. Q: Did you ask him why he destroyed the Agreement? A: No I did not. Q: Did you tell about this to Mela Karunanayake? A: I asked her about the media reports .She said they have done no wrong. Q: When did this happen, how long was this since the lease agreement had been signed? A: By then the six month lease period had lapsed. There was two months’ rent left in lieu of the advance money. A: I called Mela Karunanayake and asked her to purchase the apartment. Q: What did she say in response? A: She said to give some time for them to purchase the apartment. Q: Justice Prasanna Jayawaradena: At this point did you extend the lease agreement by two more months? Q: Did you discuss this matter with them? A: Yes I did discuss it. Q: Did you tell her how much the apartment would cost? A: Yes I said I would need Rs 180 million for the apartment. Q: Did she agree to that amount? A: No .Finally we reached an agreement to sell it for Rs. 165 million. Q: How did she find funds for it? A: She said they would obtain a loan and pay for it. Q: In whose name was this apartment purchased? Q: Justice Prasanna Jayawardena: Who are the directors of this company? Q: When was it purchased? The witness was cross examined by Counsel Kalinga Indatissa who watched the interests of Arjun Aloysius at the Commission. Q: Did you know Arjun Aloysius when you were studying in an international school in Colombo? A: Yes he is three years older to me. Q: Are Arjun Aloysius’s wife, Punchihewa, Jude Sharmantha Jayamaha your contemporaries in the international school? Q: Do you know about bond issues? A: No I don’t know. Q: Do you know that this commission has been set up to inquire into bond issues? Q: Did you agree to give your apartment on lease to Arjun Aloysius? Q: Did you have faith in Arjun Aloysius at the time? Q: Did you know that Ravi Karunanayake was living in this place after it was leased from you? A: Yes I knew it. Q: Did you want money at that time? Q: Then you must be aware of the difference between lease agreements and sales? A: No I am not. Though expected to appear before the Commission on Tuesday, Karunanayake did not. He was reported as telling journalists, after meeting with his party leader Ranil Wickremesinghe, that he had to attend the Cabinet meeting and later Parliament on that day. His attorney Sadun Gamage conveyed this to the Commission. Karunanayake did take part in the ministerial meeting where some of his own proposals were to come up for discussion. One was a request for Visumpaya, former Acland House, to be released for use as the official residence of the Foreign Minister. President Sirisena declared that the premises was once under him and was later brought under the Ministry of Megapolis and Western Development. They were now converting it into a state guest house, Minister Patali Champika Ranawaka pointed out. Striking a humorous note, Sirisena said going by the previous occupants of that residence, it was not a place that augured well for politicians. Sirisena was also not in favour of a proposal to appoint a Chartered Accountant as the Chief of Staff of the Foreign Ministry. He noted that his recommended salary of Rs 250,000 was even above a Secretary. However, ministers gave approval the previous week to a proposal by Finance and Media Minister Mangala Samaraweera to employ Razeen Sally, Associate Professor of Lee Kwan Yew School of Public Policy in Singapore as Economic Advisor to his Ministry for one year on a monthly allowance of Rs 250,000. On Wednesday, Rienzie Aresacularatne PC, now counsel for Karunanayake, appeared before the Commission and assured that his client would appear on August 2. He was unable to take part on Wednesday since he had to attend a meeting of the National Security Council. Whatever Karunanayake says before the Commission to exculpate himself will still do no good to the United National Party (UNP). The issue has come in the backdrop of the bond scam which the UNP leadership went to great lengths to defend and declare there was no wrong doing. The first parliamentary Committee on Public Enterprises (COPE) ended inconclusively due to the dissolution of Parliament. The second Committee was able to carry out what now seems a very limited probe paling into insignificance when compared to the revelations that have unfolded so far before the Commission of Inquiry. Matters have been made worse by the testimony of B.R. Chinniah who testified before the Commission on Friday. He is Chief Financial Officer of Global Transportation and Logistics Private Ltd., the firm from whom the funds had come for the purchase of the apartment. He testified that Company Chairman Lakshmi Kanthan had come to Sri Lanka on two occasions and placed cash amounting to Rs. 145 million in his safe in the company office. These funds had been used though he was unaware from where it came. Sirisena told the unions that a strike while an essential service order has been declared was illegal. As for the Union’s request not to go ahead with the Hambantota Port project, Sirisena said he would await the outcome of the Parliament debate on the matter. It took place on Friday. Trade union representatives declared that Sirisena would meet them on Tuesday and the Concession Agreement would not be signed until then. However, Prime Minister Ranil Wickremesinghe declared it would be signed on Saturday. It was in fact signed yesterday amidst contradictory remarks by the President and the Premier. The unions were represented by D.J. Rajakaruna, secretary of the Ceylon Petroleum Common Workers Union. Thereafter, a second meeting was held with President Maithripala Sirisena later on the same day, Wednesday. Six unions took part in the discussions. They were the Petroleum Operators Union, the All Ceylon Petroleum Workers Union, the Executive Officers Union, the Engineers Union, the Sri Lanka Nidhas Sevaka Sangama and the Ceylon Petroleum Common Workers Union. Trade unions opposed to the Hambantota Port project have now formed a new front. Joining them was the Government Medical Officers Association (GMOA) whose members struck work for a few hours on Tuesday. The GMOA’s demand this time was an inquiry into the attempted ‘White Van” abduction of a student leader. The move reportedly by the Police received strong condemnation. In a related development, university students are planning for an anti-SAITM protest march starting from Kandy tomorrow and to reach Colombo on August 4. On Tuesday, Ports and Shipping Minister Mahinda Samarasinghe sought approval from the ministers for the Concession Agreement (CA) with China Merchants Ports Holdings Company Ltd. (CM Port). Unlike during the previous cabinet meetings where proposals placed by then minister in charge, Development Strategies and International Trade Minister Malik Samarawickrema for a CA drew dissenting memoranda from different ministers, there was none this time. As one minister, who spoke on grounds of anonymity said, the CA had come from “President’s own man.” Heaping praise on Minister Samarasinghe were Premier Wickremesinghe, Sarath Amunugama and Mahinda Amaraweera. Sirisena then suggested a departure from the normal procedure — table the CA before Parliament and obtain approval before signing. The Ministry of Ports and Shipping released a draft text of the CA together with a news release. Though some of the most salient features were given in the news release, there were also other aspects in the 119 page draft Concession Agreement. A provision declared that “Strict prohibitions are included in the Concession Agreement to prevent engagement by the HIPG and the HIPS (the two companies) in any form of military related activities. The sole responsibility and authority for such activity and for National Security of the port of Hambantota is with the GOSL (Government of Sri Lanka). Unlike in the previous drafts, there is an additional provision which reads that “GOSL will have the right and authority to grant permission, clearance and approval to berth naval vessels in the port, on mutually agreed payment terms.” In other words, China or for that matter any country accepted by the government could pay a fee and use the port for their militaries. This no doubt places China at a more advantageous position since the port was built by it and it is now the partner in a Public-Private Partnership. Sections of the government believe that all military activity should have been prohibited in the Hambantota Port. This is particularly in view of fears entertained by western powers of China’s military intentions. Diplomats of at least two important countries have briefed many ministers in the government about these fears and their concerns. (US$ 1,519,893,773.44) primarily through commercial loans taken by the Government of Sri Lanka from the Exim Bank of China. Further investments of around US$ 600 million are needed to equip the said port and make the port fully operational. The annual loan repayment commitment for the Sri Lanka Ports Authority is around Rs 9.1 Billion.” He notes that the ‘restructuring’ will be done on the basis of a Public Private Partnership (PPP) where the GOSL (in this case the SLPA) becomes the public equity partner and the Investor becomes the private equity partner. In terms of the CA, there will be an Oversight Committee convened by the Ports Authority and including the Sri Lanka Navy, Police and a representative of the Secretary to the Ministry of Defence to manage security within and outside the port. “All personnel involved in security services and related matters by the two companies shall be Sri Lankan Nationals,” according to the CA. “I propose to establish a National Economic Council (NEC) as an advisory body on economic policy in the country in order to further strengthen policy coherence in the present consensus government, harness the existing talent of this country for national development and to meet the need for such a national body under the head of the Government in the Presidential Secretariat. “The NEC will be a professionally-managed, high-level, national advisory institution reporting directly to the President of Sri Lanka. This body will consist of various divisions in charge of key economic areas related to development plans and priorities of the Government. The NEC will make recommendations to the Cabinet of Ministers on economic policy. “1. Advise and guide the Government on matters relating to economic policy, plans, programs and management. “2. Advise the Government on the formulation of economic policies and plans that are appropriate for the economic development in a holistic and fiscally-sustainable framework. “3. Co-ordinate economic policies across different institutions to ensure that they are consistent with the Government’s economic plans and priorities. “4. Review and evaluate the institutional structures and quality of economic policy making across the Government ministries and institutions and advice on their appropriateness and changes needed to strengthen policy making across government institutions. “5. Advise on appropriate mechanisms to ensure that economic policy decisions and programs are implemented effectively in a timely manner by the responsible implementation agencies. “6. Compile and where appropriate make publicly available information on economic policies of the country. “The NEC functions as the Secretariat of the President responsible for economic policy formulation, co-ordination and monitoring of the implementation according to the economic and development priorities of the Government. The President may refer any economic matter to the NEC for its review and advice. Other than a representative of the proposed NEC sitting at proceedings of the Cabinet Committee on Economic Matters, there is no formal mention about the modalities that will link the two bodies. However, a source familiar with the proposal said the CCEM will function under the NEC and will be required to follow policy guidelines and other matters it may lay down from time to time. The CCEM was established on September 23, 2015 through a Cabinet decision. The minutes of its meetings, more often sketchy in content, are later presented to the Cabinet of Ministers for covering approval. The two main movers in the CCEM are Charitha Ratwatte, an Advisor and close associate of the Premier and 80-year-old R. Paskaralingam, a retired state service officer. Most follow-ups as well as other action to be taken are directed to them. The latter served under late President Ranasinghe Premadasa. There has been criticism, particularly among SLFP ministers, that the CCEM has been functioning as a parallel cabinet where they seldom had a say. During recent discussions with President Sirisena, they raised the same issue and complained that it was difficult for them to have the Committee address their needs. Earlier, following criticism, President Sirisena declared that he would sit at an apex meeting every fortnight where discussions and decisions of the CCEM would be reviewed. This week’s developments, particularly in respect of bribery and corruption, are bound to snowball as more details unfurl before the Commission of Inquiry. This is at a time when President Sirisena has publicly accused his coalition partner the UNP of stalling cases against former President Rajapaksa and members of his family. 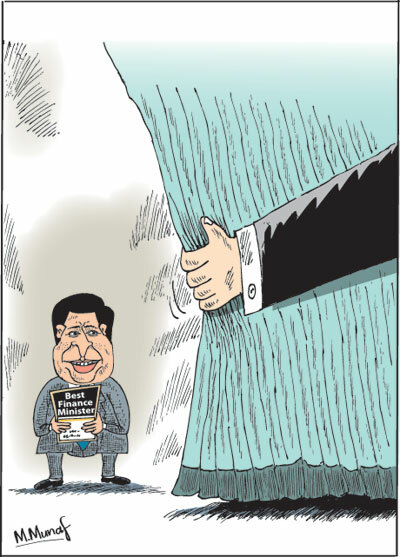 In that backdrop pressure is mounting on the UNP over new revelations before the Commission. This comes at a time when relations between the two coalition partners – the SLFP and the UNP – are strained somewhat irrevocably as the move to set up the NEC reveals. Hence more decisive moments could be expected in the coming weeks. Needless to say, the new developments have won the government a bad image and made foreign investors think twice. Adding to the growing public discontent is the latest move – unannounced daily power cuts after a reported breakdown at Kerawalapitiya power installation. One is not wrong in saying the absence of governance or the lack of it is forcing the public to pay a heavy price.